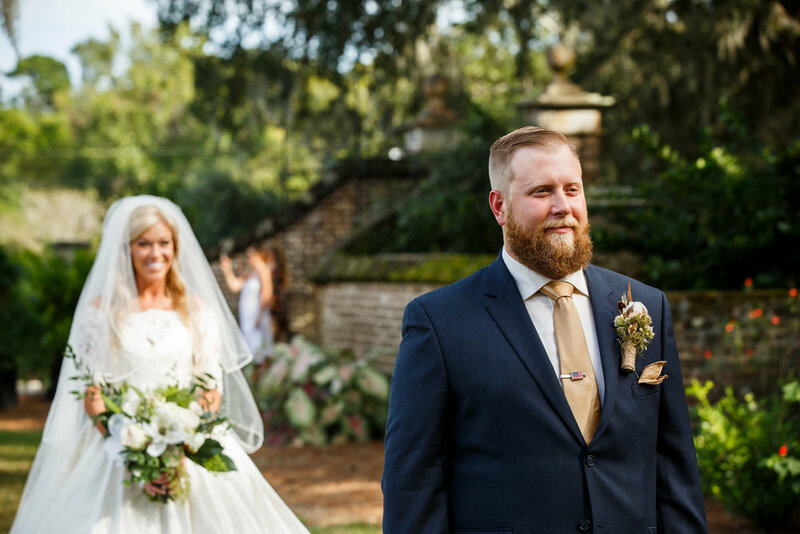 Finding the perfect balance between rustic and elegant can be tough, but Jillian and Bill's Boone Hall Plantation wedding managed it perfectly. 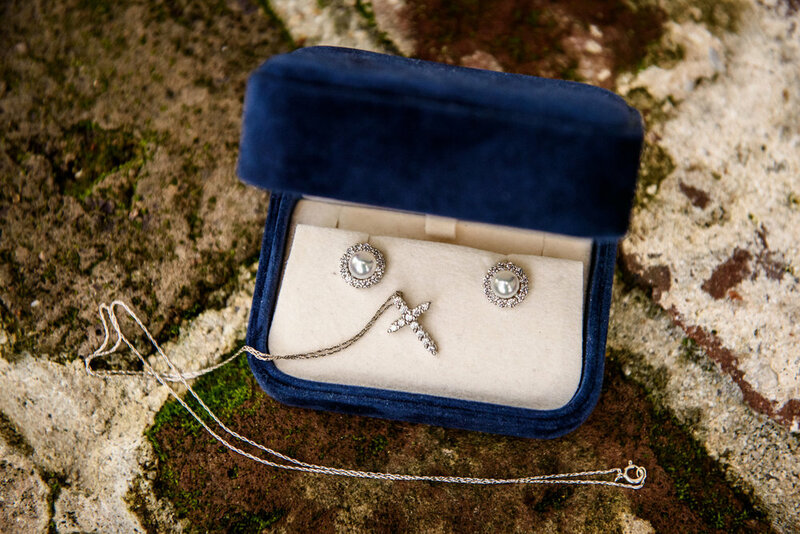 From the moment they got engaged, they knew that they wanted the historic property to be the backdrop to their vows. 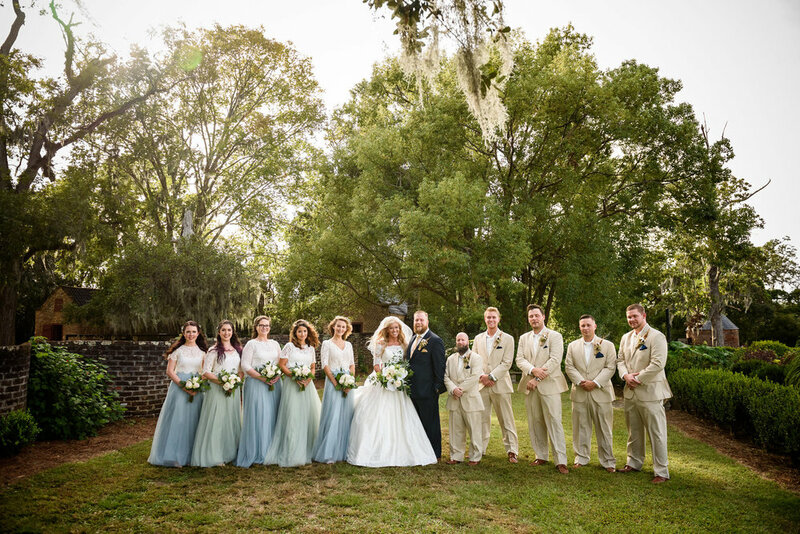 Says bride Jillian, "Our wedding was a personalized fairytale, uniquely inspired by our mutual love for God, America, the South, the great outdoors, and classic Southern elegance." 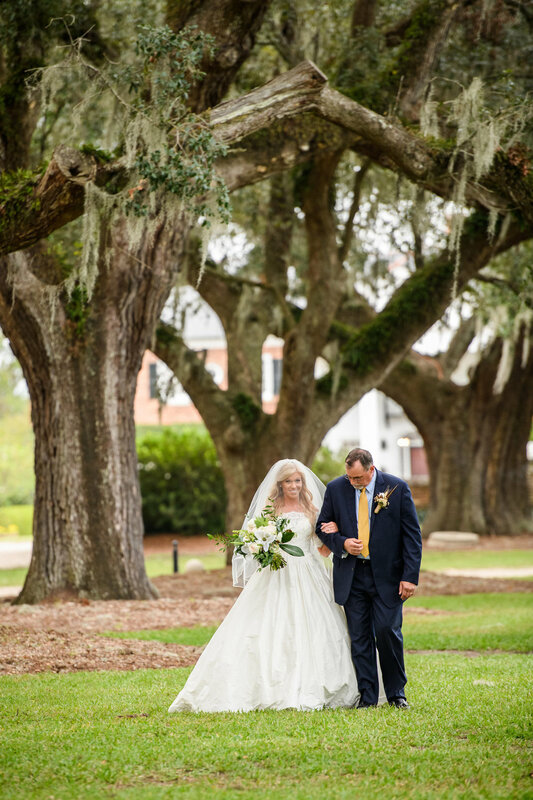 The towering oak trees of the main entrance and picturesque Cotton Dock wowed their guests from beginning to end, and Jillian and Bill's fairytale wedding was perfectly brought to life. When you've got a 300 year old property as your main decoration, you don't need much else. For Jillian and Bill, this minimalist approach perfectly aligned with their personal tastes. She explains, "We kept the ceremony decor simple, so that the focus was on the beautiful nature surrounding us and our union before God. 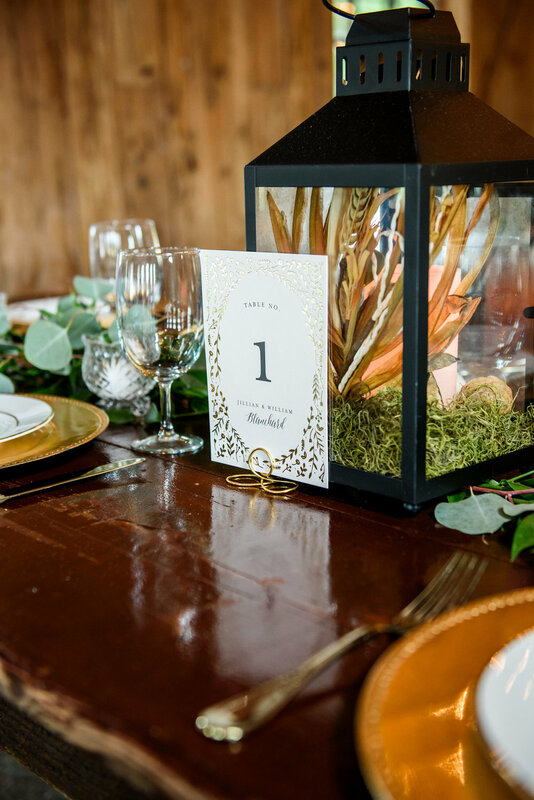 We had simple dark-wood chairs set-up for our guests, and a wooden cross with a greenery and floral arrangement at the front." When their guests moved to the other side of the property for the reception on Horlbeck Creek, the same relaxed feel greeted them. Remembers the bride, "We wanted the reception to feel like a barn party, but with a touch of elegance. So, we stuck with our minimalist design, but added touches that made it still feel and look like a wedding." Jillian's floral tastes were very specific and beautifully complemented her gown and the venue. 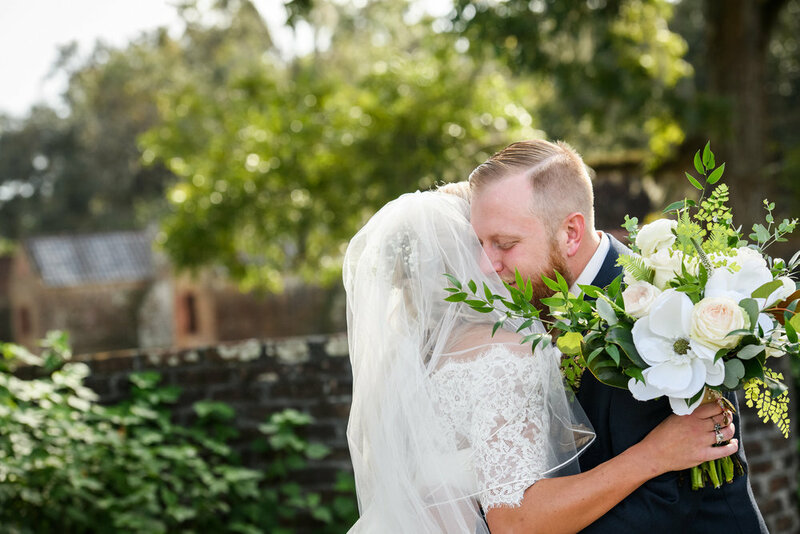 Since she preferred greenery over a large bouquet of flowers, she chose to stick with a grouping of magnolias, blush heirloom roses, and 8 white ranunculus highlighted by eucalyptus leaves and a wrap of white leather. The guys' floral accents were equally lovely. Says Jillian, "We chose to DIY the boutonnieres, because I knew exactly what I wanted to keep a masculine, outdoorsy feel. We wrapped shotgun shells in jute, leaving the copper exposed at the base, and made the boutonnieres complete with a stem of cotton, a pheasant feather, and some minimal fillers." Jillian wanted a wedding dress that would work for both her afternoon ceremony and evening reception, and would be dazzlingly elegant. She says of her initial wedding gown vision: "I have a very conservative style. I wear simple, tailored attire, typically dresses, and love detailed fabrics. I knew I wanted to stick to my go-to style when choosing my wedding dress, and also knew I wanted to feel like a princess." To her surprise, she found the perfect one on her first day out shopping. "I chose a simple, strapless, Justin Alexander ball gown made of dupioni silk. It was everything I wanted--simple and elegant, with a long train and big skirt that was perfect for twirling! The raw silk and beautiful sheen of the fabric made the dress magical and perfectly fit for my style," she says. For the reception, she removed the lace overlay, and added a sparkly belt. "It was a perfect transition, and I loved changing my look without changing my dress. I was ready to twirl the night away!" she remembers. Jillian and Bill wanted a traditional ceremony with their own unique twists. And, of course, the day wasn't complete without all of their family members involved! 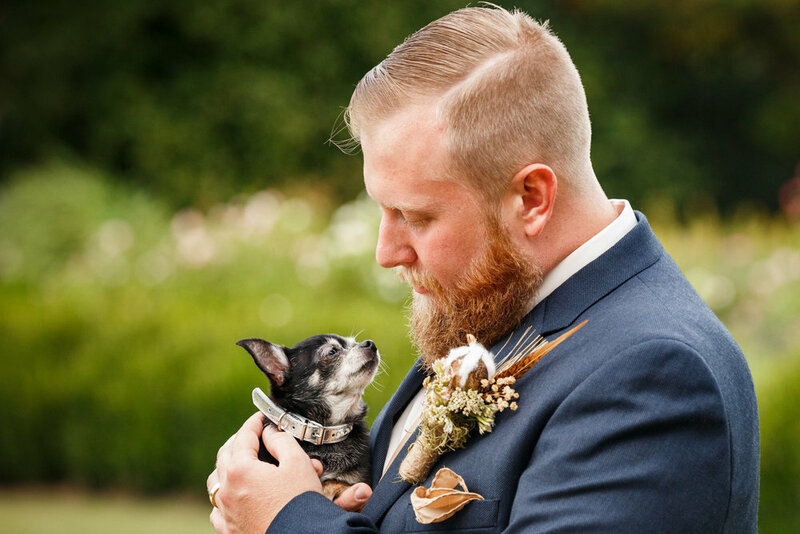 Their sweet teacup Chihuahua Bella was carried down the aisle by their matron of honor so she could be their for the ceremony. When the music for the ceremony began, Jillian found herself deeply moved. "We had a three-piece string ensemble play "Home" by Edward Sharpe and the Magnetic Zeros while our family and friends walked down the aisle. The second I heard the song start, I looked at my Dad and almost cried. It was perfect, because home is wherever I am with my husband, family and friends!" At the beginning of their ceremony, both Jillian and Bill's parents chose to renew their vows. It was a surprise for the guests and allowed each couple to celebrate a new milestone in their more than 30 years of marriage each. Once they'd exchanged vows, Jillian and Bill headed back down the aisle to a non-traditional--but apropos selection! 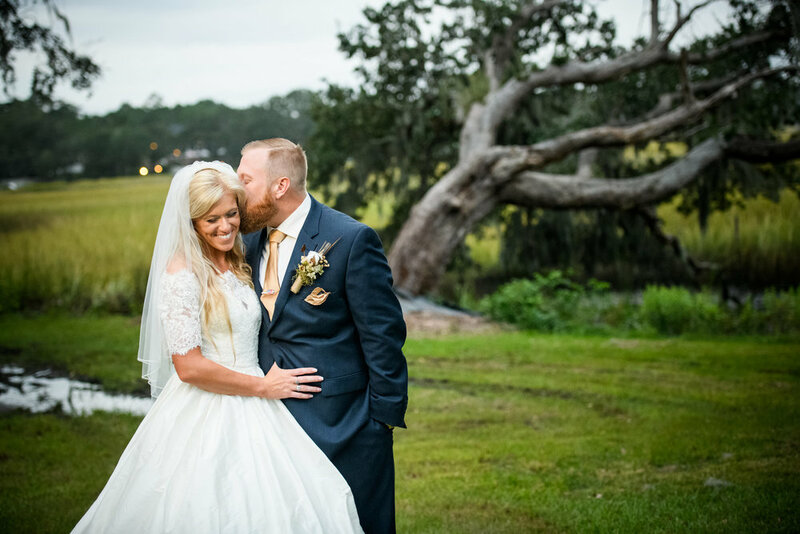 "We exited the ceremony to "On Top of The World" by Imagine Dragons, and that song was another perfect choice, because I could not imagine a happier moment in either of our lives," remembers the bride. "When the ceremony was almost over, I did not know at the time, but my Mom had planned a big surprise for me. I am a University of South Carolina alumni and a huge Gamecock fan. Throughout my husband's entire life, he said he would never leave Wilmington, North Carolina, but he did. He moved to Columbia, South Carolina with me when I went away to school, and we lived there for 5 years before returning home after I graduated law school. South Carolina and the The University of South Carolina will always hold a very special place in our hearts. The officiant began talking about our love of traditions and how I was a big South Carolina Gamecock fan. Then he started saying that there is a very special tradition at The University of South Carolina, particularly at Williams-Brice Stadium when the Gamecocks play football. 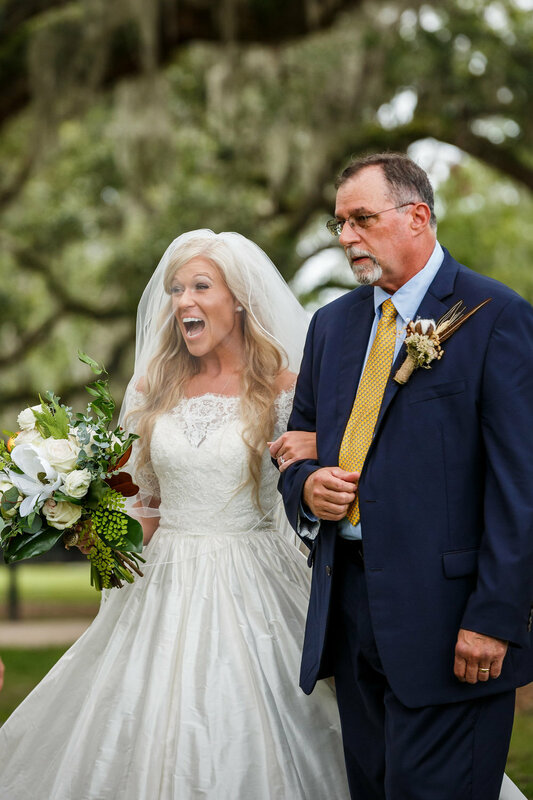 My mouth dropped to the floor when all of our wedding guests pulled white towels out from under their chairs and started waving them around in the air as we exited the ceremony."